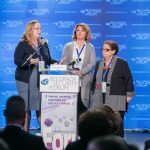 The third day of the first Belgrade Security Forum was dedicated to discussions concerning the challenges of being a woman leader in the security sector as well as to the important elements for successful mainstreaming of gender in security governance. 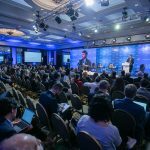 The last Main Panel of the BSF also argued the lessons learned in the Balkans regarding conflict transformation, state-building and nurturing of security cooperation. The main topics which were discussed in this session were related to the reform of the security sector, defence sector and overall changes in the concept of security, the challenges in implementation of UN Security Council Resolution 1325, and the experiences of being a women leader. 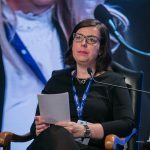 The Chair of the Panel and director of the Belgrade Centre for Security Policy Ms Sonja Stojanovic, introduced the speakers and asked them to state their opinion about security perspectives within their functions in the same time. 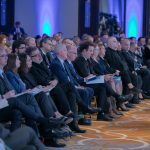 Ms. Ljubica Jelušić, Minister of Defence of the Republic of Slovenia stated her view on the issue saying that it is important to improve the system which provides security. 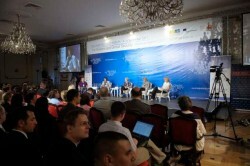 She stated that it is of utmost importance to provide legitimacy of those agencies that should be the ones that provide security, highlighting the importance of inclusion of the civil sector through operational improvement of security institutions, as well as the necessity of improvement of the professionalism of overall human potential and development of professional ethics. 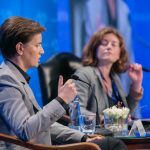 Ms Tanja Mišćević, State Secretary at the Ministry of Defence of the Republic of Serbia, stated that the top priority is to set “security threats consensus in the region”. That means that security can be efficient through work within the framework of legislation and norms posed by national but also regional law related to security. As another important thing she mentioned finding ways to address these treats. She also underlined cooperation as a principal which should be the answer on all the threats. NATO adopted the approach which will make the work more flexible. “It is important to adjust to all the changes, and this region is successful in transforming toward these challenges and changes in global perspective. This is an approach that NATO highly appreciates, because it tends to be more adoptable, more compatible and more capable in order to face all the changes“ said Ms. Stefanie Babs, NATO Deputy Assistant Secretary General for Public Diplomacy also announcing that next annual NATO meeting in Chicago should be committed to finding ways of cooperation among NATO and EU on security issues. “Resolution 1325 is about the human rights, women protection and all that addresses gender equality but the resolution doesn’t have equal reflection in the practice and results everywhere. The origin of these differences lies in the main challenge of its implementation which is changing the peoples mind-set.”, Ms Erika Kvapilova, Regional Programme Director of UNWOMEN remarked.